Scribble.08 Follows The Pulse Of The Los Angeles Art Scene. Noise: a genre that is difficult for the average person to appreciate. However, when one sees its creation firsthand or creates it oneself, noise becomes a type of musical art that takes on its own appeal and meaning. In People Who Do Noise, noise becomes associated with faces, through interviews with dozens of Portland noise musicians. The documentary gives viewers who might be unfamiliar with the controversial genre a deeper look. 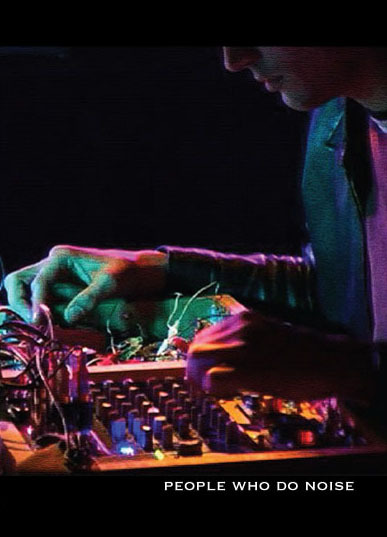 At its basest, noise is a genre that comes about through the manipulation of various instruments — often homemade — with sounds that range from dirty squeals and ambient drones to robotic pulses, and everything in-between. It can be carefully controlled, or it can be a form that takes on its own life, with very little human input, through the use of electronics. When discussed, noise can be hard to quantify with words. But listening to noise musicians discuss the creation of their art actually yields surprisingly deep discussions. Some compare the act of creating noise like working within an electronic circuit or closed environment. Others create noise because it is a reminder of an impending apocalypse to come. Still others enjoy it because it’s a type of music that’s easily accessible to all who are curious. The reasons and inspirations for creating noise are vast, but always interesting; for while some pop musicians might say, “I really like to write fun songs that make people dance,” noise musicians talk about noise music in a way that’s similar to physicists talking about physics. All of the Portland noise musicians in People Who Do Noise — from Smegma to Yellow Swans to god to Argumentix — approach their craft with a seriousness and earnestness that one can’t help but appreciate, even if one doesn’t necessarily appreciate the music itself. Nonetheless, noise musicians can also see the ridiculousness in their craft, when viewed from the outside. Musician Sisprum Vish gave an anecdote about his childhood which serves as a pretty solid example as to why people become interested in noise. He recalled being a young child who would record cartoons and slow them down because the resulting sound was appealing, and it is this kind of curiosity that is necessary for creating noise. It’s a genre for those who like to tinker endlessly — for who like to build and invent and experiment. Utilizing amazing sound mixing and a strong balance of interviews and performances, People Who Do Noise is a good introduction for those who know nothing about noise, as well as an appropriate portrait of noise musicians for those who are already interested. Like any other self-respecting genre, noise isn’t for everyone. However, it is created by people who find amusement in their craft. And although the amusement to be found in creating noise might come from engineering strange instruments or going against the musical grain as opposed to gaining fans and touring extensively, it doesn’t make the genre any less important.